Do you really need a printer? In reality, most of us do. Sure, the printer at work or at school suffices for the odd personal printout, but often you’ll find yourself in situations where having a printer at home could have saved you time, made life easier, inspired you or your kids creatively or helped you grow your business. It’s not just a case of buying any printer, though. What you need depends on who you are. So read on to find out which printer is perfect for you. The school years is when your child’s creativity kicks into gear. As a parent, you’ll be keen to keep your children creatively stimulated and prepared for all the challenges awaiting them in the new term. You’ll need a printer that is easy to use for regular assignment print-outs, but still offers an array of creative options, too. The Canon PIXMA TS9551C is a compact, A3-capable printer with A4-scanner and copier featuring a large 10.8cm touchscreen with an intuitive interface that even young children can navigate. Explore a range of creative printing options and use different media, including Canon’s magnetic and re-stickable photo paper (available from December 2018). With a new nail sticker app for iOS and Android (available from November 2018), you can even print customised nail stickers. The Canon PIXMA TS9551C can also help you create your own wrapping paper and scrapbook pages directly from the touchscreen with a choice of 45 patterns. There is endless fun in store for your children when they combine the use of the perfect printer with Canon’s free online service Creative Park. Here, a wide range of templates will allow your kids to print and put together anything from head masks and pop-up greeting cards to dolls, paper planes, dinosaur figures and model space ships. As a keen photo enthusiast, or a photography student committed to your craft, you spend the majority of your time striving to take better pictures. Seeing your work in a tangible format helps you assess and improve it, and you regularly use an online supplier of prints to show your results to your teacher, your friends and peers. But rather than having to wait for your prints to be delivered, your workflow would be much more flexible if you had your own printer. The key thing to look out for is the ability to produce high-quality borderless images up to A4 size, so you can get a good feel for the intricate details of each individual shot. The type of ink your printer uses is vital in this regard, and genuine Canon inks will ensure vibrant images. 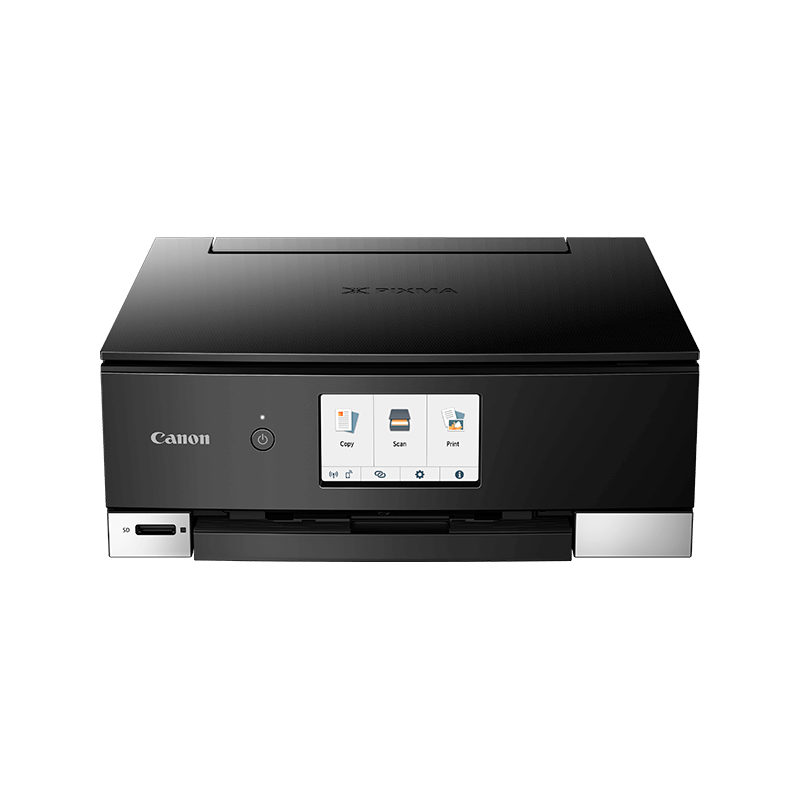 The stylish and wirelessly connected Canon PIXMA TS8250 Series uses six individual inks to produce detailed, high-quality prints. Like all the best new models on the market, it features seamless connectivity and compatibility with the Canon PRINT app – as well as AirPrint, Mopria for Android and Windows 10 Mobile – so you can easily print from a smartphone or tablet. Whether you’re spending Monday to Friday in your home office or splitting your time between desks at home and at your workplace, you’ll soon feel frustrated if you don’t have a printer in your home work space that can replicate the efficiency of a standard office space. Despite its compact size, the sleek and stylish Canon PIXMA TS9550 Series can print large documents up to A3 size – perfect for preparing prints from your home office that are ready to present to clients and colleagues. You can also create professional-looking booklets straight from the 10.8cm touchscreen. The Canon PIXMA TS9550 prints crisp documents with dedicated black pigment, and the Automatic Document Feeder (ADF) enables you to copy and scan a document of up to 20 pages at once (A4, Letter or Legal size), without having to scan each page individually. The Canon PIXMA TS9550 can even be integrated into a smart office setup. Newly compatible with Amazon Alexa*, you can print checklists and other documents by saying voice commands such as “Alexa, start Canon Printer” to an Amazon Echo or other Alexa-enabled device. You can also use voice commands to check your printer’s remaining ink levels. Wherever you go, your surroundings inspire you and you’re always the first to spot a cool photo op, which you’re quick to share on social media. But even if you upload the majority of your images to sharing sites, having a printer would give you a much more tangible way to preserve your ideas long after they’ve disappeared at the bottom of your followers’ social media feeds. You need a photo printer not just to create prints to hang on your wall, but to enable you to do more with your creations. Use these prints to further the reach of your photography, perhaps allowing you to branch out into other genres. The compact SELPHY CP1300 fits into your bag and creates fast, long-lasting prints. All you have to do is take a photograph with your smartphone or Wi-Fi enabled camera and send it to your SELPHY, which will instantly print your images up to 102x152mm (4x6 inches) and let your best projects inspire you and others in a new way. Your first exhibition at the camera club was swiftly followed by an invitation to hang your pictures at a local café, and now you’ve had a couple of requests for print sales. You’ve used a local, high-end print facility for your fine art work until now, but you’re starting to wish you had more control over the printing process, and were able to react swiftly to customer requests. Having your own photo printer would also make it easier to stock up on work to sell at local markets and art fairs. Your printer needs to be compatible with specialist fine art papers and canvas, so you can commit your images to media that will bring out the absolute best in each photograph. You also need to ensure that the inks compatible with your printer offer a colour range that is accurate and faithful. Canon’s range of professional printers, the PIXMA PRO-100S, PIXMA PRO-10S and the award winning A2 printer, imagePROGRAF PRO-1000, are the most reliable choice for anyone wanting to exhibit their work. These models use dedicated monochrome inks, meaning you can get those rich, high-density blacks suitable for the gallery walls. An added benefit of using the PRO-10S and Pro-1000 printers is that they use pigment-based inks, which retain their colours for longer, ensuring that your art will be appreciated for decades to come. Professional quality printing doesn’t have to be daunting, either: Canon’s Print Studio Pro plug-in is designed to help you achieve expert quality photo prints with ease. * Amazon and Alexa are trademarks of Amazon.com, Inc. or its affiliates.